Archie Miller will coach his first game in Bloomington on Saturday when Indiana faces NAIA opponent Marian University. The Knights finished the 2016-17 season with a record of 14-16 (5-13 in the Crossroads League). Al Durham (hamstring) and Collin Hartman (ankle) did not play during the Hoosier Hysteria scrimmage and are both likely to sit out as a precaution, according to head coach Archie Miller. Josh Newkirk also did not participate in the scrimmage but is expected to play. Saturday will be the first of two exhibitions for both squads. The Knights head to Terre Haute on Nov. 3 to take on the Indiana State Sycamores, while the Hoosiers will host the University of Indianapolis on Nov. 5. In the Crossroads League preseason poll, the Knights were picked to finish 8th out of ten teams. Marian is led by first-year head coach Scott Heady, who previously coached at Carmel High School. Current Hoosier Zach McRoberts played for Heady in high school. Heady is not the only Hoosier connection for the Indianapolis-based private school. Assistant coach Ray Tolbert was a forward for IU (1977-81) and is a member of the IU Athletics Hall of Fame. Athletic Director Steve Downing, who wore the cream and crimson for three seasons (1970-73), is also a member of the IU Athletics Hall of Fame. The only Marian player to earn preseason accolades was junior guard Wes Stowers, who was named to the All-Crossroads Preseason First Team. The North Central High School grad has already surpassed 1,000 points as a Knight. Stowers averaged 19.4 points, 3.8 rebounds and 4.7 assists as a sophomore. The 5-foot-10 guard is one of the best free throw shooters in the Crossroads League, hitting on 88 percent of his foul shots (127-of-143) in 2016-17. Stowers, however, is one of just six players returning from the 2016-17 season. The two other starters back from last year’s team are 6-foot senior guard Curtis Green and 6-foot-7 sophomore forward Samuel Guymon. As for Indiana, Miller is more focused on his own team than scouting the Knights. Hope the freshmen get some some decent playing time tomorrow. Been waiting for this first, What to expect, thread and it’s finally here.!!!!! From what Archie said in his presser, he’s going to play a lot of individuals in the first half to see how they all do. Seems like the 2nd half will be a little more focused as to who are going to start getting the “significant” minutes. This article doesn’t give enough love to 1981 Big Ten Player of the Year and Heart-and-Soul of your national champion Indiana Hoosiers, Big Ray Tolbert. What speaketh you Coach Miller? What a novel idea. How refreshing it is going to be to see players truly rewarded for hard work and execution. I’ve got 2 free tickets to the game. Would prefer to give them to a veteran. “Who ever is playing well is going to play. What’s your email address? Tickets are a pdf. That is a wonderful thing you did. Have a great weekend and enjoy Halloween. A true veteran fan, love it. Also great idea to give away on ITH. 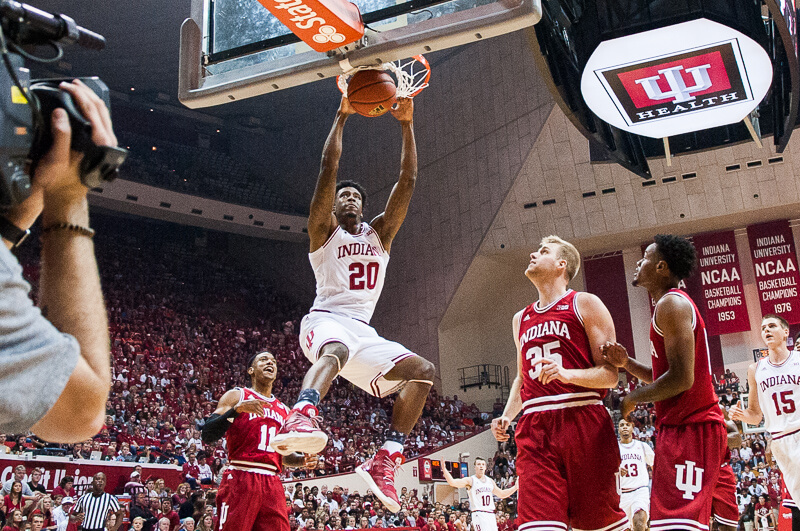 Great bunch of IU fans on here that may have not ever been to A.H.
Did you receive them ok? I know sometimes technology doesn’t work like we expect. Shawn, that’s a great idea you had. Good for you. Not lobbying for future tickets, but speaking as a veteran, that is an example of the type of things that are greatly appreciated. A kind word, or an act of kindness goes a long way. How about more love to Steve Downing, one of the 10 best players ever at IU? For those of you who don’t have B10Plus like me the game is being replayed on the Big 10 Network on Tuesday morning around 8 or 8:30! I prefer the “Having to make some adjustments during the game” quote. Haven’t had a coach in awhile that does that very well.